Last night we took the kids to McDonald’s. I recently read a blog post about the Economist Magazine’s annual article on the Big Mac Index. The Big Mac Index is an informal method of predicting future currency exchange rates between the USA dollar and other currencies. The idea is the Big Mac, the world’s most popular sandwich should cost the same in every country. It there is a difference in prices, then the currency is overvalued or undervalued and should change in the future. The cost of a Big Mac in Serbia is 200 RSD (Republic of Serbia Dinar). This was at the McDonald’s on Slavija Circle in downtown Belgrade. The current price of a Big Mac in the US is $3.54. Today’s exchange rate is $1 = approximately 67 RSD. That would make the cost of a Big Mac in Belgrade to be $2.99, significantly cheaper than the US. In calculating a purchasing power parity percentage, the RSD is undervalued by 15.68%. The significance is that the power of the RSD should rise in the future and the exchange rate of 67 RSD/dollar should fall. Dining at McDonald’s in Serbia is not the same experience as the US. 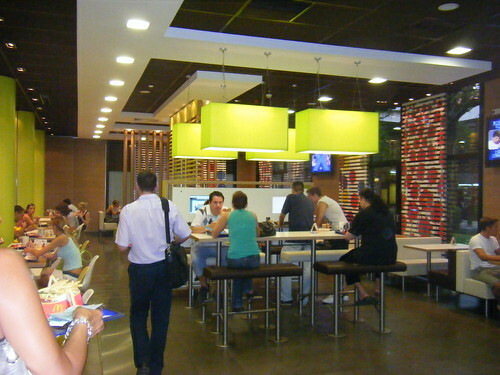 Generally speaking, McDonald’s is more of an upscale dining experience in Serbia than in the US. Lower income people in Serbia can’t afford to eat there often while in the US the poor go more often. McDonald’s in the US is viewed as a cheap meal or an eventful experience for families. We go about once every couple of weeks because the kids love it and it is an easy meal for us. I’ll be interested to see where the exchange rate goes in the first half of 2010. According to the Big Mac index, it should be dropping. I was amazed to see a double McChicken and a Mega Mac (a Big Mac with 4 paddies!) in Turkey. Intense. The Big Mac meal was 9 turkish lira (about 5.93 USD), not sure about just the sandwich, but things were surprisingly cheap, considering it’s such a big city and tourist destination. Hope you’re enjoying the break and happy new year to you guys. Never watched ‘Super Size Me’ ? Loved the documentary. I also suggest reading “The Omnivore’s Dilemma” by Michael Poulin.